I should have called my basketball-predicting season complete when I correctly forecast the winner of Tueday’s play-in game for the NCAA championship tournament. I easily picked Monmouth over Hampton — on the basis that two of Nate’s godparents went to Monmouth forty years ago. In the first three of today’s basketball games, however, I have spotted no winners among the first three games. I picked Seton Hall as an upset victor, because they used to be coached by Duke grad Tommy Amaker (and are now coached by Louis Orr), and I picked BC and Oklahoma because I didn’t think they could be upset. Still, our family will spend a great deal of time for the next few weeks scrutinizing updates from the tournament sites. . . .
Alsoft Disk Warrior seems to have saved the day again; really, I can’t imagine a Mac-based household without a copy. I rebuilt my directory, did some uninstalling and reinstalling, and everything seems to be working. That’s especially good since I’m preaching this week at St. Luke’s. The readings include the Ten Commandments (the Exodus version), Psalm 19:7-14 (“The Law of the Lord is perfect and revives the soul”), Romans 7:13-25 (Paul’s vexations relative to explaining the Law’s role in human life and sin), and John 2:13-25 (John’s version of the cleansing of the Temple — a real outlier among these). I suppose I’ll preach about the Law; I’ll try not to repeat the same old things I usually say about the Law, but it’s hard not to. Christian congregations have been so thoroughly conditioned to approach the Torah on one of several oversimplified models (none of them particularly respectful to Judaism) that it’s hard to escape a sense of obligation to make audible, make visible a different way of thinking through these theological problems). We’ll see. I haven’t even checked to see whether there’s a sermon in my files that I might refurbish for Sunday’s use. Something mysterious and non-good is happening to my iBook. Am trying to figure out what. A few Mondays ago, I caused a minor convulsion in the Force by serenading the Seabury faculty meeting with the Pittsburgh Steelers fight song (which was steeped into my consciousness in my adolescence living with a father who was a lifelong Steelers fan); the students representatives to the meeting then demanded a reprise in my New Testament II class, where I also could display the Steelers championship t-shirt that my dad had overnighted to me. Because I am just that kind of guy, I have tracked down an online version of the original performance. It comes with a slide show of the current Steelers (of whom I know nothing; I kept peering intently at the slides, asking “Where’s L.C. Greenwood? Where’s John Stallworth?” And what’s with the new numbers? Why aren’t they real football-uniform numbers? ), but the sound track reproduces the first, unsurpassed version of the Steelers Polka. Make them scramble, intercept the ball! Look at that, we have a running game! Good things soon come to those who sit and wait. Hey! The existence of this clip by itself justifies the existence of YouTube; thanks for hosting this gem. The other morning, I was walking Beatrice (who has become a presidential candidate in some of Pippa’s latest doodles) north along Orrington Avenue when I saw a bird about the size of a pigeon flying toward me at about shoulder height. As it flashed past me, I realized that it was not only not a pigeon, but was in fact a hawk of some sort — given the nesting pattern at Evanston Public Library, my first inference would be that it was a peregrine. That reminded me of last weekend in Vermont: as we were driving toward Marlboro, Margaret and I saw a bird plummet dramatically to the ground. Our first thought was that someone had shot it, but as we processed what we had seen and as we recollected that the bird had seemed to be standing up after it reached the ground, we realized that we had probably seen a hawk dive and strike. I’ve always felt a sympathetic affinity to hawks (I wanted to say “accipiters,” but that subgroup of hawks includes only a few of the birds in question); seeing them as part of my daily life elates me. It may be too much to imagine that, in the present political climate of national pathology triggered by strangers and danger, the witness of Christian Peacemaker Tom Fox might quicken the consciences of political incumbents, or inspire resistance to fear-mongering and scapegoating among the world populace in general. Something, sometime, will make clear just how grim, how cynical, how exploitative and degraded the U.S. government’s policies have become. Evidently tens of thousands of Iraqi civilan deaths haven’t done it. Thousands of U.S. military deaths haven’t done it. 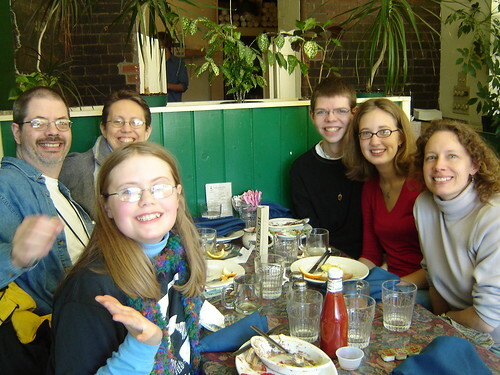 I doubt that Tom Fox’s faithful witness will get enough media play to provide the occasion for repentance (maybe if he had been a young, attractive woman from an upper-middle class family); but he has contributed his life to catalyzing that recognition. The sooner, the better. Ora pro nobis, Tom — while we search our hearts for the courage and determination to look at brutality, call it by name, and refuse to comply with its advocates. I graded and handed back the “Bible content” final exam for my New Testament II class — based on the Presbyterian Bible Content exam — and the good news is, all my students could become Presbyterian ministers (at least, as far as their knowledge of the NT epistles is concerned). My terrific daughter arrived home last night from her sojourn in Maine; she had a spectacular time with her aunts, and now I’m delighted that she’s back to help me with the groceries, the dog, the recycling, and all the other complications that I’m liable to lose track of without her. 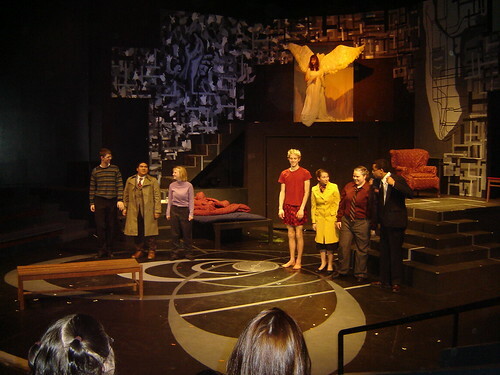 That’s Si, as Louis, at the extreme left, next to his roommate Simon (who played Joe). I’ll add some pictures of my own later. . . .
I’ve wondered idly, for a while, whether the correct locution for those snatches of aural information was “sound bites” (which I’d always thought it to be) or “sound bytes” (which I’ve seen increasingly frequently). At first, I was sure it must be “bites,” but I realized that my confidence rested solely on that being to form I’d been approving for years — self-justifying prejudice. “Sound byte,” on the other hand, modified “sound” with a definable quantity of information, and an appropriately small one at that, so I reckoned that I ought to let go my predisposition and actually learn something about the subject. I first checked the Wikipedia which, though fallible, offers a helpful starting point for online inquiry; it favored “soundbite” (one word), without even mentioning “byte” as a possible error. Then I ran into the eggcorn database which takes up exactly my question, and comes down in favor of “bite” over against Lou Marinoff’s sniffed dismissal, “ ‘sound-bite’ is nonsense.” The scale of evidence tips decisively when a commenter notes that the OED cites a public example from 1980 — well before the digital storage of audio information would have made “sound byte” a coherent term. Parenthetically, the whole phenomenon of “eggcorns” opens a new horizon of linguistic fascination for me…. I’ve known Carl Conrad a long time online, and I sense that he may have said something like this before — but the remarks that jps reports put the finger exactly at a dangerous soft spot of theological education. The vast preponderance of seminarians and divinity students learn Greek in order to decode the hidden message concealed in those ominously different-looking letters (be they Hebrew or Greek), not to learn how to read well the texts written in those languages. Indeed, that sensibility of decoding a cryptogram often carries over into further dimensions of the interpretive task, so that students (and some teachers) suppose that there’s a single hidden “correct answer” to each of our interpretive problems. It ain’t so, it can’t be so, and in order to recuperate from the delusional hope/need that reading work this way, we have to learn first of all to read rather than to decode. It ought not be too hard; we read most of the texts we encounter and interpret. Unfortunately, years of decoding-thinking (structured into the ways biblical languages are taught and into the ways Scripture is deployed in theological argument) have saturated the imaginations of at least a generation’s prominent theological spokespeople, and any recognition that reading well entails more than decoding risks being shouted down as “relativism” or “postmodernism” (in the derogatory sense).